Serving All of Southeast Florida with our specialty in residential air conditioning repair. Tired of all the heat? Make sure your AC unit is working by having air conditioning repair done by Aspen Air Conditioning. We have been serving Boca Raton and the local area since 1983. Perform a complete system evaluation to determine why your system is not working properly. Explain to you what we found along with a list of options (from a basic air conditioner repair to an optimal, longer-term solution like air conditioner replacement. Offer our UP FRONT pricing to show exactly what the repair will cost before we start the job (no surprises). Use drop clothes to protect your home during the repair and clean up completely when done. We offer fast repair service to restore your comfort – as your comfort is our number one priority. Did you know 90% of our service calls are completed the same day? When you call for AC repair, our knowledgeable technicians will drop by your house with fully-stocked trucks that have a wide range of parts. With over 34 years of experience in the industry, we have encountered all types of residential AC units. Some of the brands we’ve serviced include Carrier, Rheem, Lennox, and Trane. Our AC repair experts can provide you with a faster, more accurate diagnosis. Our technicians are instructed by the manufacturers when new technologies and procedures are brought into the field. When we arrive on the job, we will take the time to inspect your AC system, explain what’s wrong, and be transparent about how much it will cost you. We pride ourselves on our no risk pricing – so you can be sure the price we give is the price you get without any extra fees tacked on. Once you’re happy to proceed, Aspen AC will waive the service call fee for you. Need a second opinion – for free? We can help you with that. Our technicians are all NATE-certified and have rigorous training, which means they can do complete diagnostics on your AC unit and then provide you with our own quote. If you’re interested in this service, you will need to have a competitor’s quote of $400 or more in order to qualify. 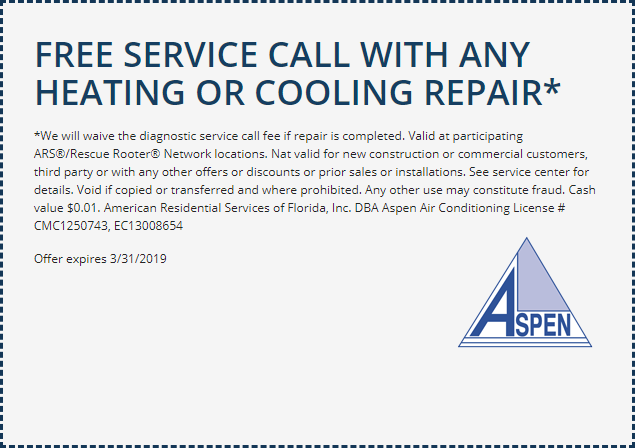 Why Call Aspen for Air Conditioner Repair? We have earned our reputation as Boca Raton’s largest AC repair and replacement company by providing fast, dependable service to our customers. We are committed to fixing your system right the first time and on time. We focus on keeping our technicians highly trained and making sure we exceed our customers’ expectations on every job that we perform.